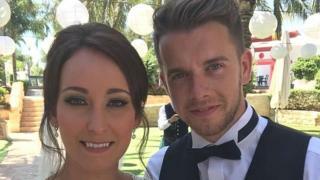 When someone told Adam Maxwell his wife had died, his first instinct was to phone her.A Spanish policeman broke the news to the 27-year-old over the telephone at midday on 29 April, just as he settled down at his home in Livingston to watch a football match. "It was actually the Rangers-Celtic game that was kicking off. I remember that vividly," he said. "In very broken English, [the officer] asked me my name and if I was seated. He explained to me that Kirsty had died. "I got very little apart from that. The phone call was then over - I thought it was some sort of prank phone call and immediately tried to phone Kirsty. "Obviously I got no answer from her phone so I tried to phone one of her best friends who was on the hen do as well and she confirmed it was true. "His wife of just seven months has been found dead at a holiday apartment block in Benidorm, south-east Spain, after apparently falling from a 10th floor balcony.It was less than 24 hours since Adam had dropped her off for her transport to the airport. Adam's next call was to Kirsty's mother, Denise Curry, who was driving into town with her sister, Kirsty's aunt.She told BBC Radio Scotland's Kaye Adams programme: "The call came through and it was just a voice saying 'Denise, Denise.' And then I realised it was Adam. "I said: 'Adam what's wrong"I was feart to go in the house to hear the words from Adam. So my sister went in the house first and I followed and Adam, his words to me were: 'Denise I'm sorry. It's Kirsty. She's dead.'" The family's shock at hearing the news of Kirsty's death has not yet begun to fade. But six months later they say they don't know for certain if the 27-year-old fell, jumped or was pushed. "I can't go into great detail about what I think because the investigation's still ongoing at the moment," Adam said. "But there's a lot of things that we now know and all we're trying to do here is get a full investigation in to Kirsty's death. There are so many unanswered questions that we've been asking for six months now. "In the last few months, the family have been able to piece together some of Kirsty's last moments at Apartamentos Payma.They know she had arrived at the hotel the evening before and gone out straight away with her friends after dropping off her luggage.They know she had been drinking - but had returned to her hotel room with an earlier group and was asleep when the rest of her friends came back.And they know that somehow she ended up in the wrong apartment before she died. Her father, Brian Curry, told the BBC: "We've got a video of Kirsty sleeping. They've been out and had a drink as girls do. They've come home and went to bed and one of her friends thought it would be funny if we make a wee video of her. "So they made that video... and then they went to sleep. "Now between that time of them all going to sleep, Kirsty's woke up and for whatever reason - we're not really sure if it was medication or if she needed something for her contact lenses - she went out the room to look for her friends' room. "It was just before 07:00 and Kirsty's family believe she became locked out of her room and so wandered around the hotel trying to find another room where some of the group were staying.The hotel corridors all looked the same and were likely in semi-darkness. Kirsty was possibly disorientated and had only spent minutes in the hotel before heading out for the night to go drinking the previous day. She knew some of her friends were on the 10th floor, but her family believe she made a mistake and instead entered the apartment of five British men on holiday, which was next door to her friend's room.At some point in the next 30 minutes, Kirsty died.Four of the men inside the apartment at the time have been questioned over the death in a Spanish court. A fifth British man was arrested and then released.The Spanish authorities have taken no action and all the men have been allowed to come home to the UK.But the family said they remained convinced that something "sinister" happened to Kirsty and have now employed an independent investigator to look into the case.Former police officer David Swindle said the inquiry had been labelled as a murder investigation - but wasn't being treated as such. "One of the big issues is that there's 20 friends of Kirsty's and there were no statements taken from them all," he said. "They only took a full statement - or a declaration they call it - from one of Kirsty's friends and some notes from the others. "Mr Swindle said he had now statements from the whole group and had learned "significant information" he considered as "potential evidence".The investigation is still open and is being treated as "complex" by the Spanish police.The family said they would continue to pressure on the authorities here and in Spain to continue the inquires into Kirsty's death. "It's our daily life," Adam told the BBC. "It doesn't go away. I don't think it ever will. It's all-consuming."